Bathroom cement render, patching up the walls. The walls have been strippped of tiles, and bathroom cement render has to be applied to smooth them out and make them acceptable for waterproofing and tiling. The surface that ceramic tiles are to be fixed to should be clean and straight with no loose material. It is pointless spending a lot of time and money on a bathroom renovation if the all important preparation is not done well. Every link in the chain has to be strong. The surface that takes the render/plaster/topping has to be clean and solid. The render/plaster/topping has to be correctly done to provide a solid and straight base. The correct waterproofing materials should be used in the specified manner to ensure that water cannot penetrate to other parts of the building. The tiles should be laid using reccomended adhesves that are compatible with the waterproofing compound used. I am going to tile the whole of the walls in the bathroom to a height of 2100mm so the parts of the walls that were not previously tiled had a textured paint finish on them. These had to be scraped back of loose paint. They came clean quickly. A 50mm wide paint scraper got under the paint layer and it came off fairly easily. The walls that had been tiled were a bit rough, some patches had rock hard tile adhesive still on them and in others parts the tile and adhesive came off together with patches of the old plaster. 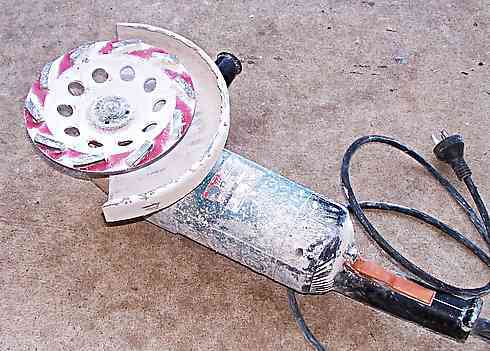 I tried grinding off the hard glue with my angle grinder but it was not really successful. I wasn't taking much of the old glue off because it was so hard and yet had a consistency that the diamond blade didn't seem to work on. Yet at the same time when I over ran a bit, I was digging into the parts that had no glue, so I gave it away and decided to plaster up to the level of the old glue. I lightlty ground up every wall surface that had to be worked on, even the ones that looked good where the paint layer had peeled off easily to give it a good mechanical bond for the next work. So mixing up some plaster as described on the previous page I primed and plastered the wall patches that needed it. I laid the stuff on thicker than necessary and leveled it roughly, and then left it for a couple of hours. When it was quite hard, I used an aluminium screed to sort of scrape off the excess and bring it to a reasonable surface. Picking the right time to scrape it back is a bit tricky. If you try too soon you are basically doing what a tradesman plasterer does, and that takes a lot of skill. More than I have anyway. With the bathroom tiles going on later to cover up my patchy work, I was fairly confident that I could get it good enough. So it has to be reasonably smooth to take the waterproofing, but a finish sinilar to a painted wall is not required.